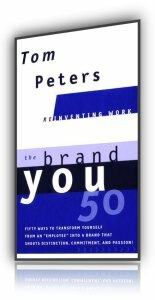 Amazon link: The Brand You 50 : Or : Fifty Ways to Transform Yourself from an 'Employee' into a Brand That Shouts Distinction, Commitment, and Passion! Y-O-U CAN MAKE A DIFFERENCE! RIP UP YOUR DILBERT CARTOONS! THE WHITE COLLAR REVOLUTION IS ON! 90 PERCENT OF OUR JOBS ARE IN JEOPARDY! MAKE EVERY PROJECT A WOW! BE DISTINCT ... OR EXTINCT! IT'S A NEW MILLENNIUM: IF NOT NOW... W-H-E-N? The tough old union militant remembers. In 1970 (not exactly an eon ago) it took 108 guys some five days to unload a ship full of timber And now? Container daze: eight guys... one day. It happened on the farm when the thresher came along. It happened in the distribution center when the forklift arrived. And it happened dockside. It's a brand-new ballgame. THE WHITE COLLAR REVOLUTION IS ON! The accounting "shop" is coming under the same productivity searchlight that those docks did. And we think we have an inkling of what the new rules will be. The revolution: Information systems. Information technology. Enterprise Resource Planning systems. Intranets. Knowledge-capital-management schemes. Enterprise Customer Management. The Web. Globalization. Global deregulation. Etc. Etc. All fueling a—no hype—once every 100, 200, 500 (?) years revolution. The Larger Picture: The "Model"
1a. When Was The Last Time You Asked: What Do I Want To Be? 2. You've Gotta! Finally: It's The White Collar Revolution! 3a. Holy toledo! Brand you magnified. What if we each had personal "market cap"? Four: How About A Bumper Sticker That Describes Your Essence? 4a. We Need A Snapshot! 5. Forget "Job." Forget "Tasks." 10. Ready To Play The Great Game Of Business? 22. You Are Your Rolodex I. Manage The Hell Out Of Your Community/Network! 23. Are Your … Rolodex II. You Are As Broad/Wise As Your Collection Of Freaks! 26. You Are Your "Big Ideas"
29. Bosses: Brand You Should Be Your Cup Of Tea! 31. Remember: A Brand A "Trust Mark." 34. Join Toastmasters. You Are Your Own P.R. "Agency." 37. Invest In Yourself. A Formal Renewal Investment Plan (R.I.P.) Is A Must! 42. Make Our/My/Your "Organization—Me & Co., Brand You—Special From The Get-Go! 43. Brand Yous Lead! At All Ages! 44. Become A "Power Freak." 45. What's Your Formal Word-Of-Mouth Marketing Plan? 45a. Please Answer: Do I Really Have A "Product"? 48. Are You A "Closer"? Brand You's Have Got To "Ask For The Business." The professional service firm50: transform your "department" into a professional service firm whose trademarks are passion and innovation! The project50: or; transform every "task" into a project that matters!